Join the NSGSA for our next journal club on Thursday, April 4th! Palm oil is a hot topic: it can exhibit both protective and detrimental effects on health; is being added to more and more processed foods; and increased production contributes to deforestation and climate change. 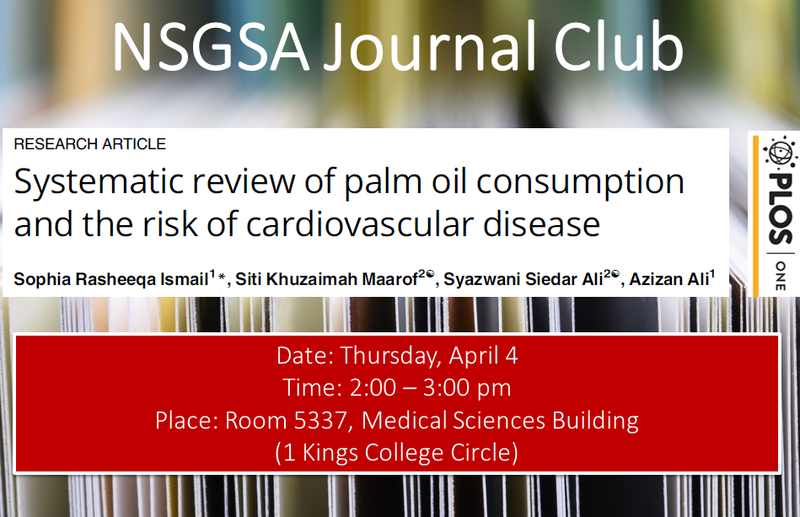 As such, we will be discussing this recent review of palm oil on the risk of cardiovascular disease. Citation: Ismail SR, Maarof SK, Siedar Ali S, Ali A. Systematic review of palm oil consumption and the risk of cardiovascular disease. PLoS One. 2018;13(2):e0193533. No experience required – we are looking forward to learning more about palm oil and it’s effect on disease together!